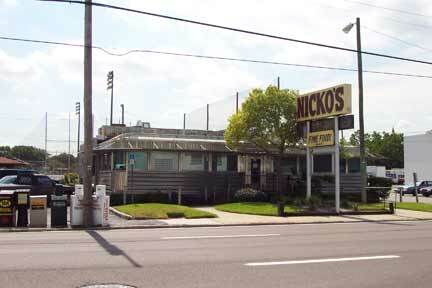 I was taking some pictures of Nicko's Fine Foods to send to a band that is playing at Skipper's this coming Tuesday. The Waybacks (video here) said in their newsletter that they were looking for interesting places for breakfast. Where better? I looked over my shoulder and saw some woodworking equipment that turned out to be Ernie's Woodwork. He's the guy that does the old style windows with what is probably the old style construction, hidden mortise and tenon. the " top of his head " price he gave me was $130 for a single glazed window and $490 (?) for complete frame and 2 windows. I didn't study them closely but it seemed to be quality workmanship. He also does screens and hinged storm shutters. No more hauling plywood sheets up a ladder for the second floor windows.